Hey guys, so as you know I visited New York two weeks ago, for me New York consume the month of March! I would normally do a monthly favourite post but I feel that most of the things I will talk about are the things I bought when I was over there. I thought I would combine the two, telling you my March favourites but also showing you what I purchased. If you know me, you will know I love a good Victoria's Secret shop. Without putting them online, I purchased a lot of underwear as they are the comfiest things ever! Surprising I didn't go all out and refrained myself from going overboard. 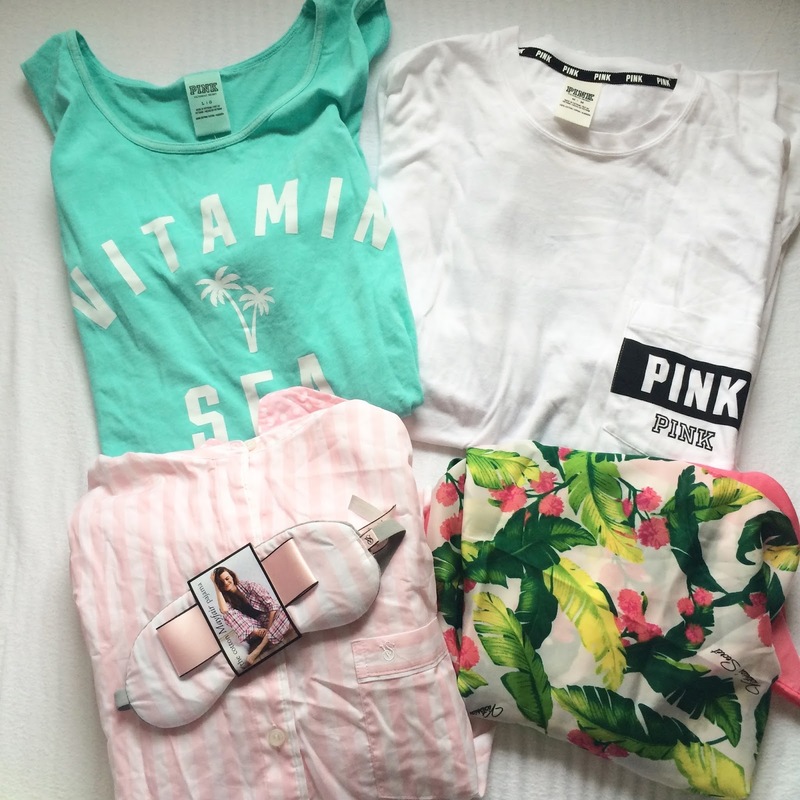 I did pick a few items, first one (top left) is this 'Vitamin Sea' tank top. I actually saw this Anna Saccone-Joly snapchat and fell in love. I absolutely love the colour and think the saying is too cute. Next up, (top right) is a simple PINK long sleeved white top. I have been looking, in general, for a top like this, it has 'PINK' all the way down the back which I think is so cute. It is perfect for lazy days or a casual outfit. (Bottom Left) I finally got my hands on VS pjs. I've looking for a set like these for a while, I just love the idea of having VS pjs. There was a lot of summer sets but I wanted a long set. I got my hands on this gorgeous white and pink set. They are quite thin but surprisingly they are still warm. I don't know why but I feel like someone from Gossip Girl whilst wearing them, but I have fallen in love. (Bottom Right) Last thing in the picture is a VS gorgeous floral Sarong, the print is just gorgeous and it is really soft, I haven't had any use of it just now but I do love the spring/summer print! Last VS items is a PINK Bralet . It is very similar to my Calvin Klein Bralet I received at Christmas, but as I wear that a lot I thought I would buy something similar. It is very comfy to chill in and I adore the colour. Last fashion items I bought where from Zara. I have never been in a busier shop than the Zara we were in Soho. We waited in the changing room queue for just under hour, yes the changing room queue! It was insane, and we have no idea why we did it. I ended up picking up two pair of leggings, a strip baggy dress, the 'Girl Gang tee' and this 'Are you Gluten Free' cropped tee. 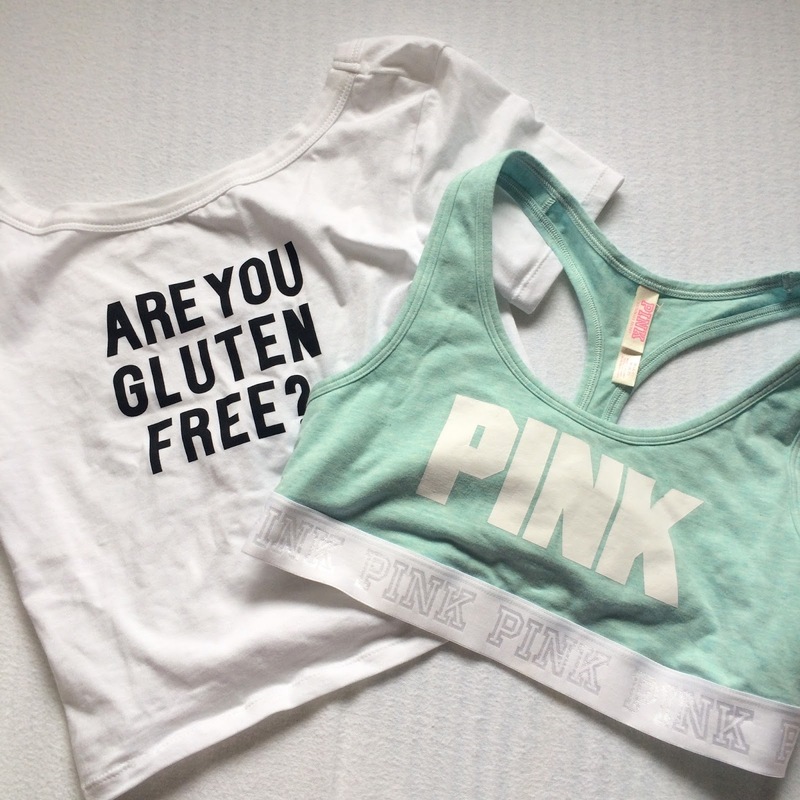 I didn't even try this on as I seen it after but as you know I am Gluten free so it was must! I didn't go as crazy on make-up as I thought, I suppose I got a lot at Christmas and didn't really need anything else. I did however pick a few bits from Sephora. I've been needing to find a primer, I have been using a mini sample of Mac' Prep and Prime but it is starting to run out. I decided I wanted to try something other than Mac so I had a browse in Sephora, they have a section on the end of stands that have 'The Best...' so when I seen this 'HourGlass Veil Primer' I thought I would give it a bash. I really rate Hourglass products, I love how it feels on my skin and I have seen a difference in my make-up! 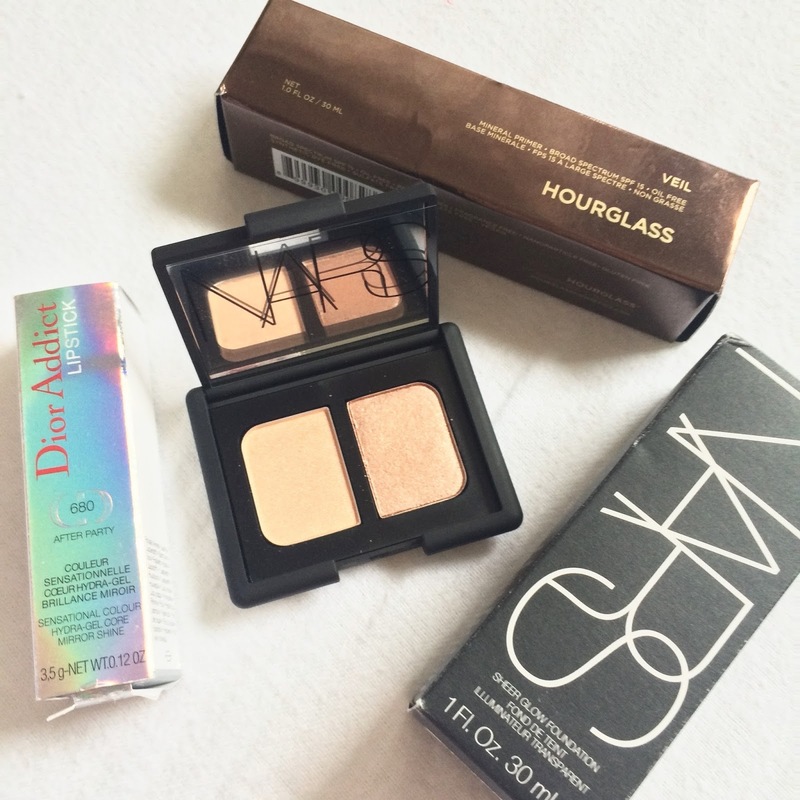 Ive heard a lot of great things about Nars eyeshadows, so I took the chance to have a browse. I only picked up one, but it is gorgeous. I picked up 'Silk Road' it has a pretty gold and a brown copper colour. Coming into the summer I think it will be perfect for a golden look! Then I purchased my HOLY GRAIL foundation, 'Nars Sheer Glow' in the shade Mont Blanc. I've talked about this foundation many times so all I'll say is that I still love it. The last make-up product was kind of a splurge, Steph and Amy went on a bike ride so I was left in a shopping centre for an hour, so I blame them ;) If you know I am a massive Jennifer Lawrence fan and have always wanted one her Dior lip products but didn't really want to spend that much money. But after getting the lip maximiser and lip glow from Dior I fell in love! I decided to treat myself and pick up 'Dior After Party'. I love how it is a shimmer shade, and I love the colour. Although I haven't tried it yet I have heard it is amazing. The last few pieces I picked up would of 100% be on my favourites. First up is this super irrelevant Mug from Francesca's. I adore this shop, it has a lot of quirky item that I love, I did a full haul here from my summer holidays last year! I saw this mug and had to buy it! I've been using it for water as I don't want to ruin it, but I just love it! From Sephora I then picked up Invisibobbles, I hadn't heard or seen anything about these but they looked interesting so I had to try them. As they say they wont give you that annoying line you get when taking a bobble out and I feel it had helped with not getting tangled hair! If you see them definitely pick them up! Crest Pro Health Toothpaste has to be the best whiting toothpaste out there. Having used their white strips for years, they have started to hurt my teeth. So when I used this at the end of last year it was the answer to my problems! I picked up another set as I was running out but I love it! It does take a bit longer to do your teeth but it is well worth it! 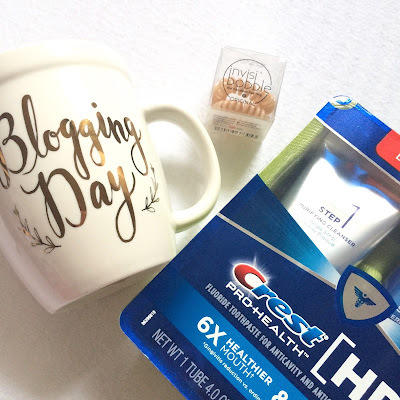 Last two items are a first in my monthly favourites! I never really post or talk about jewellery that much but I am super happy with these purchases. I picked up these set of ring in H&M After I have been wearing my Tiffany Love ring I have fallen in love with wearing rings. Although I don't want to spend that must on another one, I wanted a few more. These are simple rings and are perfect to add to my outfit! 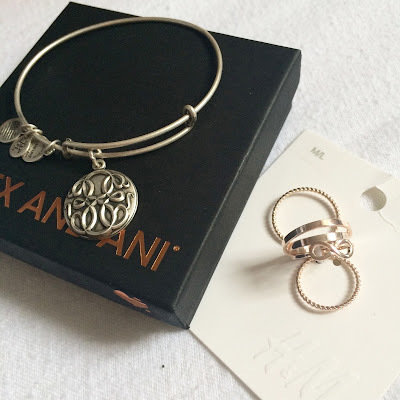 I have been wearing the infinity ring and the bobble ring the most and been loving it! Last but not least my Alex and Ani bracelet! I have heard a few things about these bracelets over the years but as I don't live in America I have never really researched them, until we were browsing the shops in Soho. I love the idea of the bracelets and as much as I could of bought the whole shop I went with the Path of Life. It represents 'Knowledge', 'Strength' and 'Motivation' which is what I need. I have been wearing it all the time and it has helped me! Hope everyone had a great Easter!! !